A historical occasion: The Separation of Church and State: The Separation of Spiritual and Temporal Powers of the Dalai Lama. The institution of Dalai Lama or Gaden Phodrang dates back to 1642 when the Great 5th Dalai Lama assumed Tibet’s political leadership role. The 3rd Dalai Lama while on a visit to the Mongol Chief Altan Khan, received from that ruler the honorific title “TA-LE” which got anglicized as “DALAI”, the Mongolian equivalent of the Tibetan “RGYA-MTSHO” meaning “Ocean”. Tibet existed in a serene and unperturbed state for several centuries until October 1950 when Communist China’s People’s Liberation Army invaded Tibetan soil. Tenzin Gyatso, the present 14th Dalai Lama fled from Tibet following the failed Tibetan National Uprising in 1959. The 14th Dalai Lama has voluntarily relinquished his political powers. The Tibetan Parliament-in-Exile must derive its power from The Constitution of Tibet. The power of the people of Tibet must be now vested in the Constitution of Tibet. Amendments in Charter of Tibetans in Exile to pass political authority to an elected leadership would not suffice. 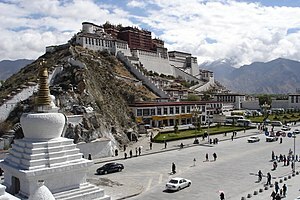 March 10, 2011 could be marked as a historical moment in the long history of Tibet. The 14th Dalai Lama had issued a statement to voluntarily relinquish his political leadership role. 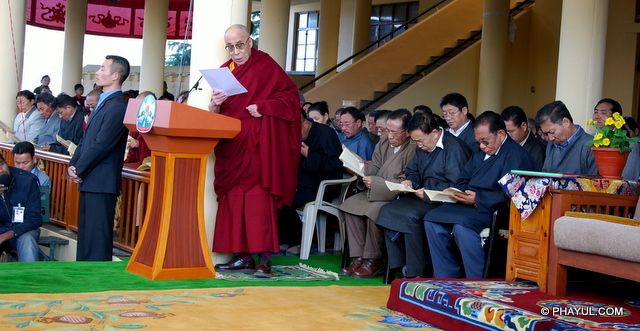 The Dalai Lama formally communicated his decision to the 15th Tibetan Parliament-in-Exile on March 14, 2011. He has recommended a democratic system of governance for the Tibetan polity. He has recommended Amendments in Charter of Tibetans in Exile to pass political authority to an elected leadership. 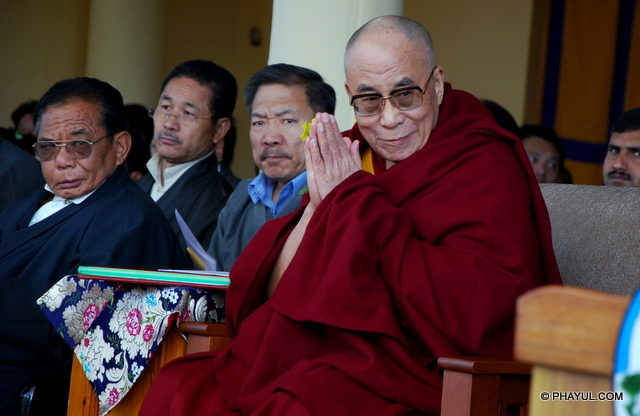 The Dalai Lama will continue as the Spiritual Leader of the People of Tibet. Tibetans must now derive their political rights and authority to govern themselves from powers vested in the Constitution of Tibet. I welcome this statement from 14th Dalai Lama seeking the separation of temporal and spiritual powers from the institution of Dalai Lama or Gaden Phodrang. The Dalai Lama institution will continue to exist and the Dalai Lama would continue as the Spiritual Leader of the people of Tibet. The Living Tibetan Spirits tell me that they would accept this decision made by the 14th Dalai Lama. Now, the people of Tibet need to derive their rights from a duly established Constitution of Tibet, a written document that would state the fundamental laws and the principles of governance for Tibetan people. The Tibetan Parliament-in-Exile must derive its authority and power from the Constitution of Tibet. Amendments in Charter of Tibetans in Exile will not help this transition of political power from the Dalai Lama to the people of Tibet. The Tibetan community in Exile must draft the Constitution of Tibet and get it ratified by all people of Tibetan origin and Tibetans inside Tibet should be given an opportunity to ratify this Constitution of Tibet at a later date when the foreign occupier of Tibet is evicted from the Land of Tibet. Tibetans are not seeking separation from China. Tibet is not a part of China and the Problem of Tibet is its military occupation. Special Frontier Force is a multinational defense plan that aims to establish freedom and democracy in the Land of Tibet. Service Number: MS-8466/MR-03277K; Rank: Lieutenant/Captain/Major; Branch: Army Medical Corps/Short Service Regular Commission/Direct Permanent Commission(1969-1984); Unit: Headquarters Establishment Number. 22, C/O 56 APO(1971-1974); Designation: Medical Officer; Organization: Special Frontier Force. How Does the Dalai Lama Change the Tibet Question? Although the 14th Dalai Lama has been talking about stepping down from the leadership of the Tibetan Government in Exile for some time, his final decision announced on March 10, did shock his people to an extent, and posed big question mark to the world at large. The effect has not fully sunk in yet. It will, when the new Kalon Tripa (Prime Minister) is elected on March 20 by the All Tibetan People’s Deputies (ATPD), which gathered in Dharamsala from March 14. It is to be noted that the Dalai Lama chose March 10, the 52nd anniversary of the Tibetan peaceful uprising against the Chinese. Some may interpret this as the Dalai Lama’s decision to give up his peaceful struggle for the autonomy of Tibet within the Chinese constitution. This is not correct, though the outgoing Kalon Tripa, Prof. Samdong Rimpoche was dismayed that the way the Dalai Lama was received around the world was unique, and his political successor may not achieve such status. While that is true, one needs to carefully study his March 10 statement. The 76-year-old religious leader revered all over the world said his desire to devolve authority had nothing to do with a wish to shirk responsibility. It would benefit the Tibetans in the long run, and that he was committed to playing his part in the just cause for Tibet. The Dalai Lama made it clear that the Tibet cause and the Tibetan people would remain his highest consideration. He would be available for consultations and advice. He would be travelling the globe where he is welcome, meet the world’s leaders both political and religious but as a monk reminding the world that Tibetan Buddhism, language and culture was on the verge of extinction in China controlled Tibet. As a religious leader, these activities are well within his bound. Although the Chinese leaders and officials will continue to attack him, they would risk doing so without legitimate basis. Within hours of the Dalai Lama’s announcement, Chinese Foreign Ministry spokesperson Jiang Yu said “He has talked often about retirement in the past few years”’ adding these were “tricks to deceive the international community”. This was brave face but other official statements do not effuse a lot of confidence. Tibet’s Communist Party Secretary Zhang Qingli, used insulting language describing the Dalai Lama as a “wolf in monk’s robes”, and again charged him for trying to “split” China. But ethnic Tibetan leaders of Tibet were a little more circumspect. Qiangba Puncog, Chairman of the Standing Committee of Tibet autonomous region’s people’s congress commented that he could not deny that the Dalai Lama, as Living Buddha and a religious leader did have some influence on his believers, and his death would have “ some minor impact on Tibet”. Padma Choling, Chairman of the Tibet autonomous regional government went even further. He told the official China Daily that the reincarnation of the institutions of the Dalai Lama and Panchen Lama have been carried on for several hundred years, these historical institutions and religious rituals of Tibetan Buddhism must be respected, and it was not up to anyone to abolish the reincarnation institutions. It must be said that both the ethnic Tibetan leaders, though sworn to protect the party and government, allowed a glimpse into their inner thinking. They made it clear that while they were committed to perform their official duties, they do not condone insult of the Dalai Lama and do not contribute to the Chinese government’s policy appointing their own Living Buddhas especially the Dalai Lamas and the Panchen Lamas. This mind-set will play a significant role in the future politics in Tibet. The Dalai Lama’s decision to devote his political responsibility was deeply thought over for several years. He is also similarly thinking whether he should leave the directions for the search of the 15th Dalai Lama after his death, and who should be appointed with the responsibility for the search. There could be problems like the search for the 17th Gyalwa Karmapa of the Karma-Kargyu sect, where the four regents fought and there is now more than one claimant to the 17th Karmapa’s throne. The Chinese would get into the fray as they did in the case of the 17 Karmapa, and declare their own 15th Dalai Lama. The gap between the 14th Dalai Lama’s death and finding the real successor will be very crucial. Hence a purely political set up to fill this gap would be very important. If need be, only the political leadership would continue with the Tibetan agenda. There is also the question of Ughen Thinley Dorjee (UTD), the most talked about 17th Karmapa, though Thaye Dorjee, then other claimant has also significant following among the Karma-Kargyu community both inside and outside Tibet. Both have following among foreigners in the West and South East Asia. This is a very difficult problem. The Dalai Lama would have to resolve it in some manner. The Indian government is hardly in any position to intervene in and resolve the 17th Karma dispute. It has taken the only sensible step it could. The seat of the Karma-Kargyu sect, Rumtek monastery in Sikkim, has been locked in the interest of peace till the real 17th Karmapa is agreed to by all concerned. India has been keeping away any kind of Tibetan politics including against China, and the Chinese acknowledge that officially. Ughen Thinley Dorjee is recognized by both the Chinese and the Dalai Lama. The Dalai Lama played no direct role in the UTD case. He only accorded his recognition in 1992 while he was in Rio de Janero, when Tai Situ Rimpoche, the Regent promoting UTD, told him over telephone that UTD was recognized by all the Rumtek Regents as a consensus. Sections of the Indian media created a mess recently when they called UTD a Chinese “spy” over unaccounted foreign currency found at his monastery. The confusion was due to the fact that UTD’s office failed to follow the process to legalize the donation from his followers the world over including from China. There has been a lingering doubt about UTD and his loyalty especially because the manner by which escaped from Lhasa to India over five days and four nights without being detected by the Chinese security. Further, the Chinese government never criticised him, nor has UTD stood up vocally for the aspirations of the Tibetans. 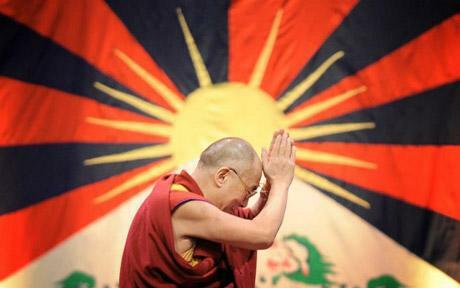 He is, therefore, not yet a candidate to take the Dalai Lama’s place as a religious or political leader of the Tibetans. UTD will have to prove his position one way or the other. He is 24-year-old, and the Dalai Lama demonstrated his religious and political leadership at a younger age. What is moot, however, is how the new structure in Dharamsala will impact the main support bases of the Dalai Lama and the issue of human rights in Tibet. The mainstay has been the US especially the White House. The Dalai Lama has significant support in Europe, but not always steady. There are Japan, Taiwan and Australia. But the Chinese have used their economic muscle to buy out the western human rights critics. Nevertheless, the instrument of pressure on China are very much there and could be turned on and off depending on China’s political and strategic behaviour. There will be quite some challenges for the Tibetan movement in the initial stages. But eventually the move can work out right. The Dalai Lama would have more time to concentrate on religious groups in the USA and Europe who have significant political influence and are livid with Beijing’s religious persecution. The fires can be stoked. And such fire can easily spread to China’s western region of Xinjiang which witnessed bloody anti-Han riots by Muslim Uighurs in July 2009. That region remains restive. The political Tibetan government in-exile would have a much freer hand. They are not expected to foment unrest inside Tibet. They are wise enough to know that just simple unrest cannot stand up to the Chinese security forces and the army. But the people inside Tibet do not need orders from outside. Most of these are coming to an understanding they are losers any way, and will keep opposing the Chinese regime. The political leadership of the Tibetan government in exile, though not recognised officially by any country, will have the latitude to lobby more actively in the United Nations, the Unrepresented Nations and People’s Organization (UNPO) in Europe, and important capitals of the world. If they get sufficient support and work unitedly without squabbling among themselves, they can raise a huge movement which could seriously challenge Beijing’ unreasonable attitude. India may face a politically sensitive situation with China. The Chinese are convinced that it is the Americans who are at the root of the strength of the Tibetan movement. They are not sure how much India is a party to this conspiracy, but they will harden their attitude towards India. India must tell the political government in-exile that there are boundaries in India that cannot be crossed. But at the same time, must allow them to work within what India’s constitution and laws allow them to. New Delhi must also weigh its policies in the light of revelations how China and Chinese agencies have been assisting Indian insurgents in the north-east to wage war against the state. It will have to be a balanced approach. In sum, the future is not yet clear. But in the long-term the Dalai Lama’s decision could greatly change the dimensions of the Tibetan movement in their favour unless they directly confront Beijing. Big issues must be left to big powers. Pingback: EAST AND WEST – LEARNING AND CREATIVE WRITING | Bhavanajagat.